Dressy Bessy will make their Yep Roc Records label debut with the release of KINGSIZED, their first studio album in seven years. Slated for February 5, 2016 release, the album is now available for pre-order with an instant download of “Pop Phenom,” which is available to share/listen below. Recorded in their home studio, the 13-track set features Tammy Ealom (vocals/guitar), John Hill (guitar), Craig Gilbert (drums), and Marcus Renninger (bass). The melodically infectious, lyrically barbed new tunes such as “Lady Liberty,” “Make Mine Violet” and the anthemic title track showcase the band’s uncanny ability to wrap.Ealom’s personally charged, pointedly subversive lyrics in sparkling, irresistibly catchy songcraft. 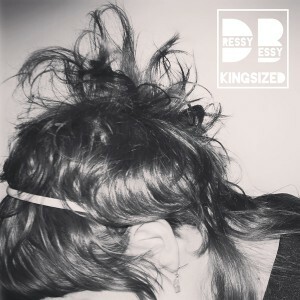 Formed in 1996, Dressy Bessy have released numerous singles, had tracks featured on various compilations and recorded six studio albums, including Pink Hearts, Yellow Moons (1999), California EP (2000), SoundGoRound (2002), Dressy Bessy (2003), Electrified (2005), and Holler and Stomp (2008). I had forgotten about this band. I am pleasantly surprised.